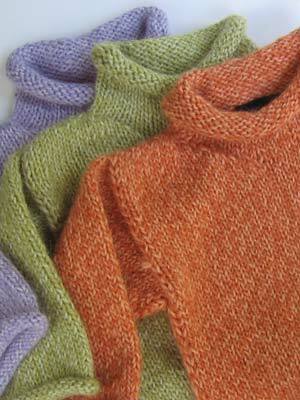 Beautiful, soft baby alpaca in an easy-on, easy off rollneck sweater - wide arms, wide body - so it lasts more than a month! And it's the best luxury fiber around. Baby Alpaca is a hollow-core fiber, which means it's a great insulator - but it is also lightweight. And it breathes. In 3 great colors, this is our signature baby sweater, to wear and wear and wear... and it makes a beautiful handknit gift - don't forget to check out our matching hat & sweater sets!